1/2 cup plus tbsp. honey…. ( used sugar instead ) I have even omitted surgar since hubby is diabetic. 3/4 cup milk and then ………. 1/2 cup melted butter. Add cup of raisins / currents/ nuts/ dried cherries etc. Combine wet ingredients AFTER yeast has foamed. Slowly add flour and dry ingredient mixtures, one cup at a time until a thick dough is formed. Knead x 10 minutes. Place in a greased bowl let rise x 1- 2 hours. Punch down, divide into 2 pieces, and shape in a greased bread pan. Let rise until double in size x hour. Bake at 350 x 45 minutes. Mix shortening, sugar, eggs, pumpkin and water. Blend dry ingredients together. Slowly add to wet ingredients till well mixed. Add raisins, nuts, dry cherries as desired. Bake in pre- heated oven@ 350 degrees x 1hour and 10 minutes or until toothpick indicates batter bread is done and the toothpick comes out clean. Well I have a glut of pumpkins this year so I made homemade puree. Baked the cleaned and seeded pumpkin in the oven till soft. Then purreed in the food processor. You can also cube, 1 inch size, clean pumpkin ( peeled or unpeeled) and freeze in bags in one cup or two cup portions.. Great for adding to stews and soups….. or purree… Tends to be a little watery… but just drain. 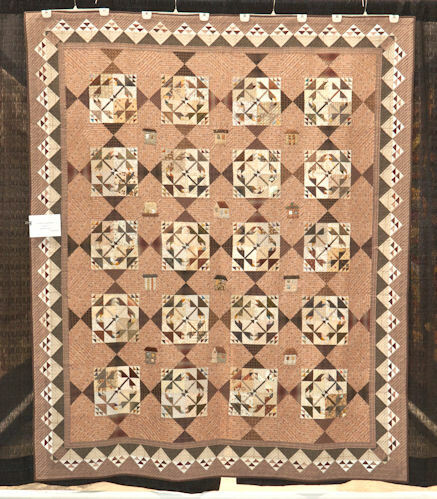 More pictures of Kim Diehl’s quilts … for inspiration. 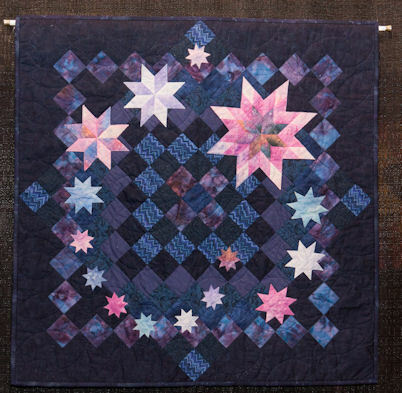 The Quilt that launched, Kim’s career. 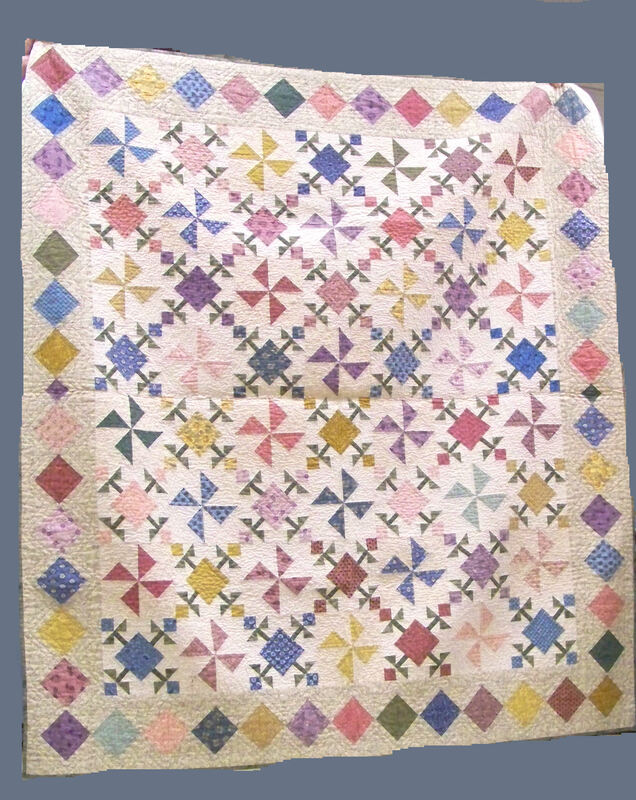 At her editor’s behest, Kim made this quilt from pastel colors. She says she loves the pattern but she pastles are not her favorite colorway. What do you think? 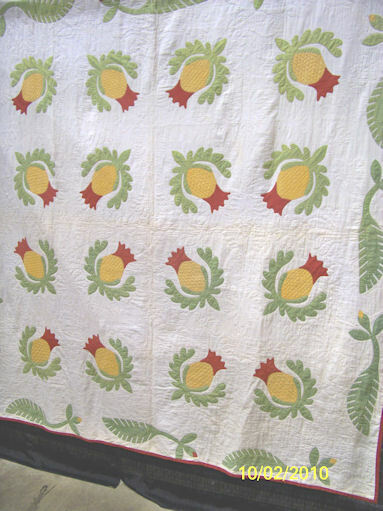 This quilt was stunning especially with all those little berries. Better photographs can be seen in Kim’s books. You know how it is at a guild meeting. The ladies show off the quilts but their arms get tired holding them up. 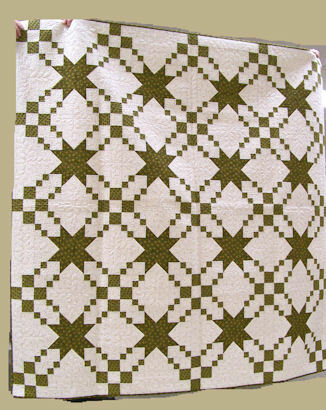 Two color quilt / Ohio Star in an Irish Chain setting. 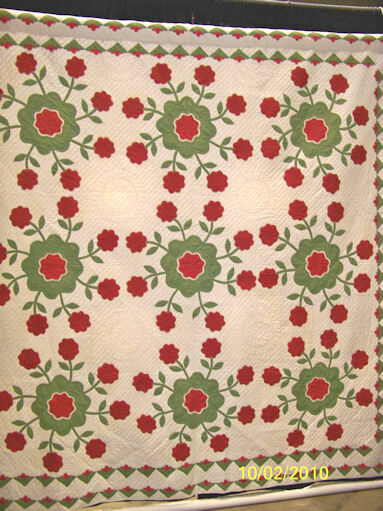 Kim says she likes two color quilts because they are classics. 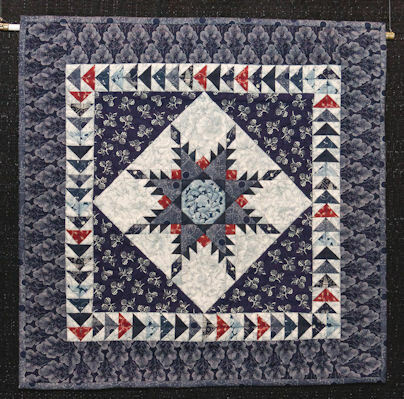 I belong to the Evening Star Quilt Guild in Davison Michigan. Last night we were treated to a trunk show featuring the quilts of Kim Diehl. 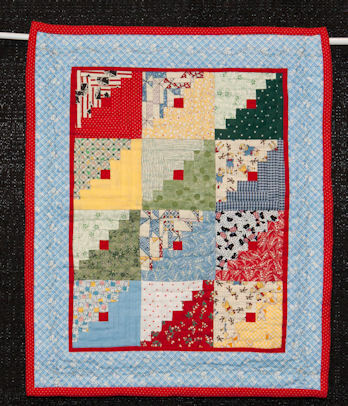 Kim is a quilt educator, a book author, a pattern and fabric designer. 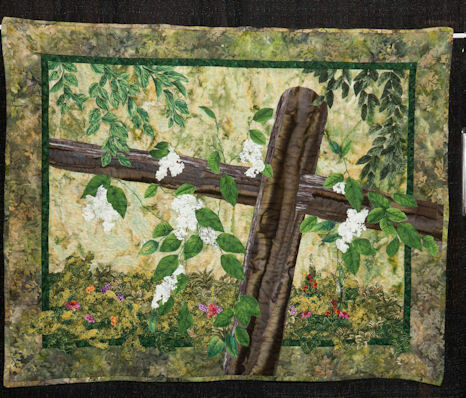 Kim is delightful and kept us all in stitches with her commentaries about the quilts. Each quilt was displayed as Kim told us the history behind the design and pattern. In Kim’s lecture she explained how she selected some of the design elements in each quilt. I am not a traditional quilter but, what I enjoyed about the lecture was her telling us how she arrived at some of her design decisions. The design process as Kim was explained it, shows quilters that her patterns are considered a jumping off point to allow the quilt maker add their own elements and surprises. I think that is what impressed me the most about Kim she encourages quilters to add their own elements, style and colors and not be a slave to the patterns. Kim also brought in students who complete one of her previous workshop with samples of the work they were able to complete. Well I am going to let Kim’s quilts speak for themselves as dinner is calling my name. Marinated Roast Pork and my favorite baked potatoes. I will posts more pictures of Kim’s quilts later. I like the quilting along the stripes, simple but effective. 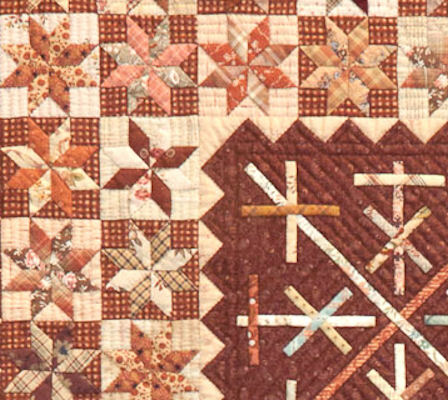 I love the simple quilting detail of stitching along the striped background. I love Circle / Curved blocks, but I have only made one or two. 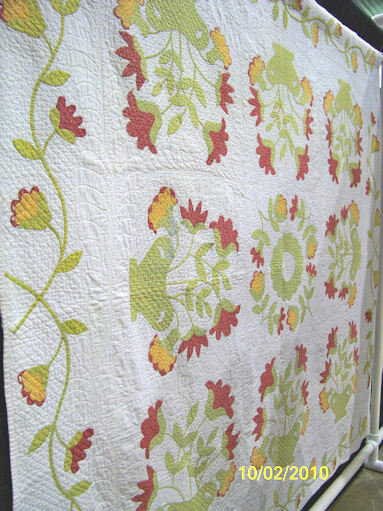 I think I would like to make this quilt in my signature CRAZY BRIGHTS. 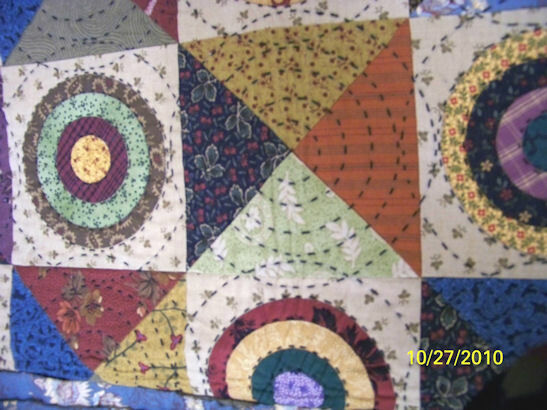 I LOVE the details of the big stitch quilting in the circles. Wall hanging using Kim's fabric line. 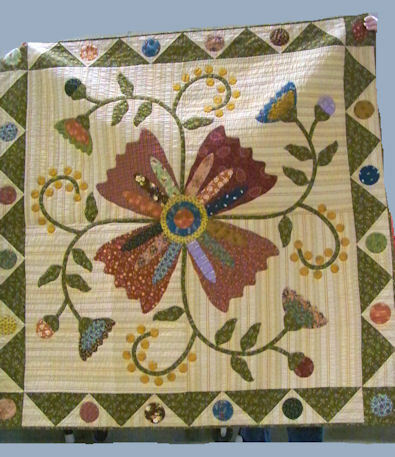 Close up of machine applique using Kim's fabric line. 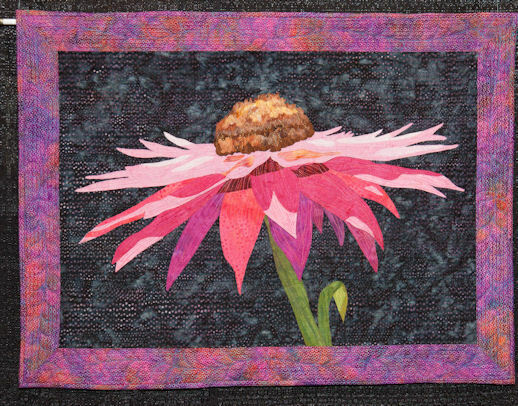 Mini Quilts and Wall hangings, too! 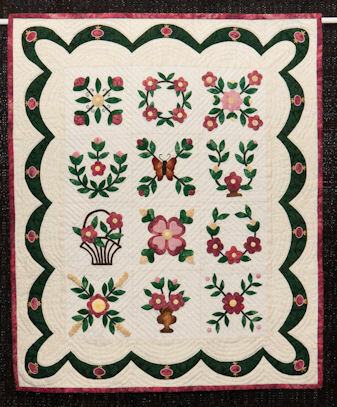 The quilts in this collection were all wall hangings less than 30 x 30 inches in size. 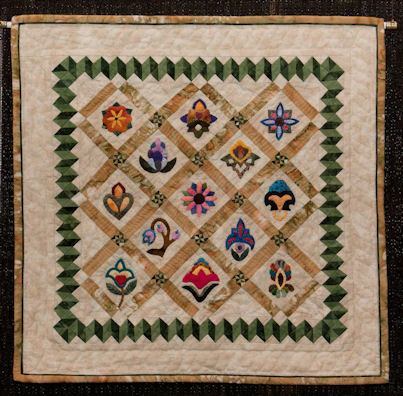 There also was a grouping of miniature quilts where the patches were less than an inch in size and most of the completed blocks were two to three inches in size. ENJOY !!!! Feathers less then the size of a dime. When no one was looking I carefully measured some of these patches and ….. THEY WERE SO TINY! I also liked some of the “Art” wall hangings displayed. 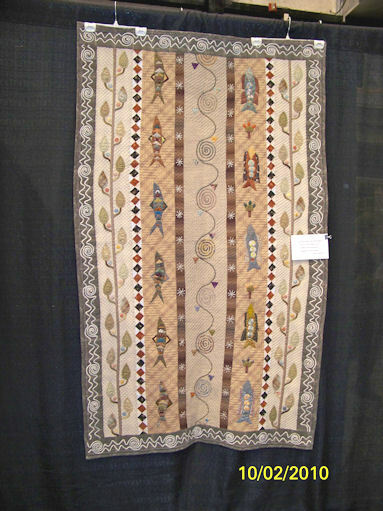 At this quilt show I had paid particular attention to the various quilting techniques both machine and hand work, the motifs used and the density of quilting. 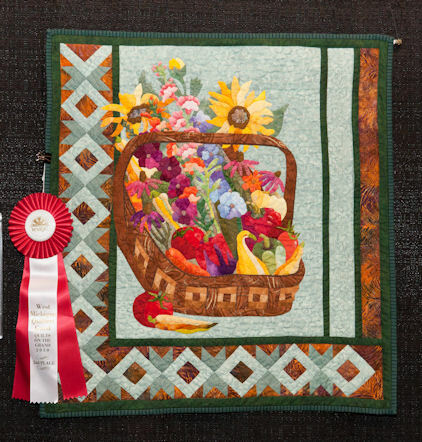 Many in the art quilt category resulted from a work shop with Sharon Schambers…. I am so jealous! ENJOY !!! 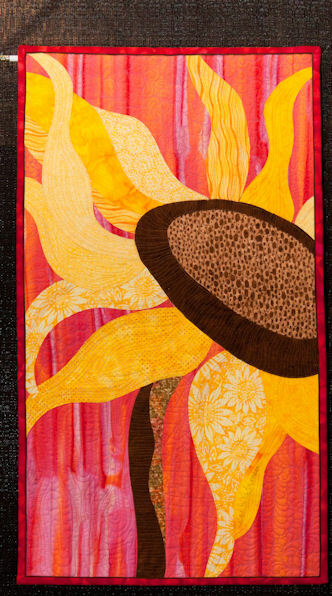 Let me remind everyone this is not my work but pictures I took at the Grand Rapids Quilt Show. 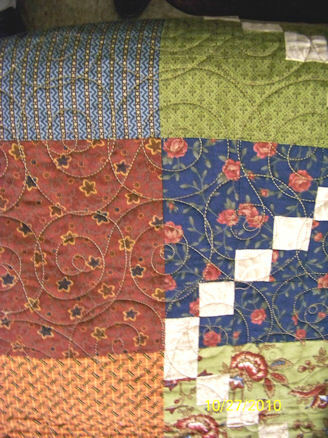 I am currently interested in the various methods of quilting the tops being made. I do try to take pictures of the quilt with the written information cards from the show but they usually can not be read on the pictures. I do not have enough battery capablities to take pictures of both. I was able to view long arm machines at this show. 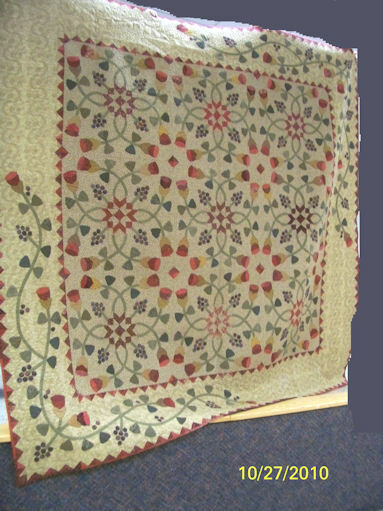 Recently I was able to see demonstrations of domestic machine quilting using different types of frames, including the John Flynn at a workshop. Both were interesting. I bought a used John Flynn frame but I am totally intiminated by it. If I ever get to use it I will review it. KNITTING, KNOTTING, it is winter hat season. 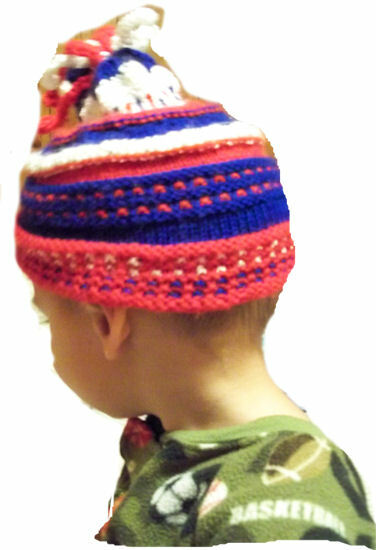 My grandson's 2010 winter hat... did you ever take a picture of a three year old? Here is a picture of my grandson’s newest winter hat. Every year I try to knit him a new hat to match his winter coat. I started it last year and never finished it. I got it out earlier this week to work on it. I have to make two more …. and one or two for his cousin then back to quilting I go. I know how to knit and crochet but I do not like it that much… a little hat or scarf now and again for a child is okay but nothing bigger. Can you say boring ! 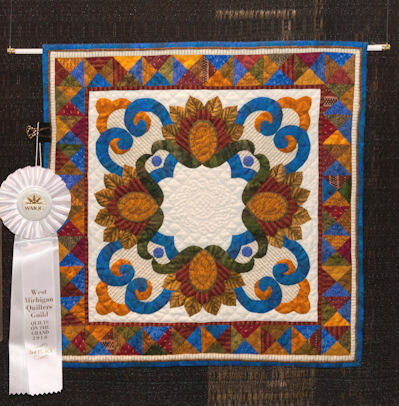 I still plan to post more pictures of the Grand Rapids Quilt Show, I just do not know when I will have the time to play on the computer. I also plan to try and get a better picture of my grandson wearing the hat but I was really surprised he let me take this one. His idea of wearing the hat is to pull it over his face. At the Western Michigan Quilt Show there was an exhibit of quilts from their sister city of OMIHCHIMAN, JAPAN. I was fascinated by hand quilting. The stitches were tiny and the lines were just a quarter of an inch a part. 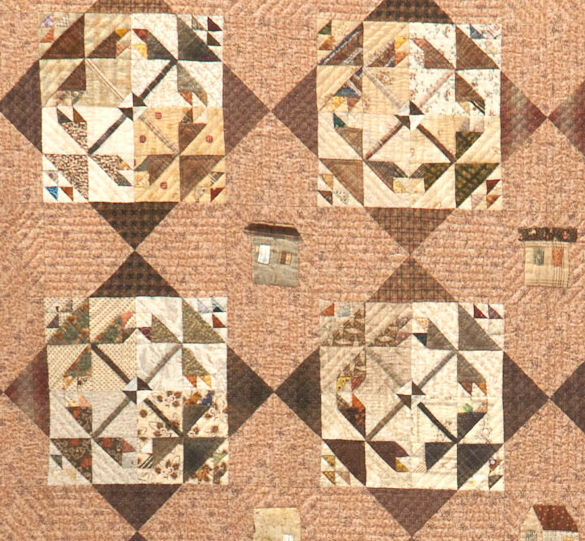 This resulted in a dense quilt, similar to some machine quilting I have seen. 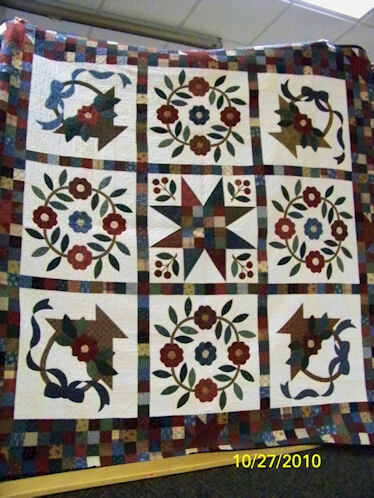 I have tried to post pictures of the quilting. 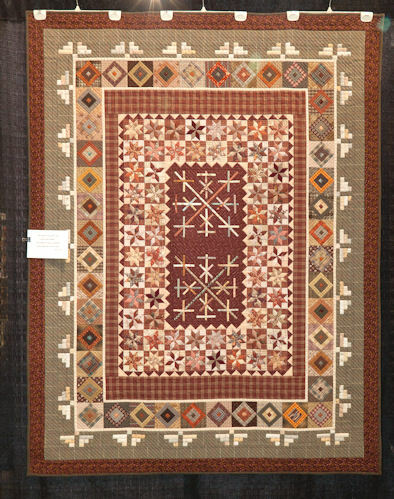 I paid particular attention to the quilting in this quilt show, since I am in the process of leaning how to quilt on a domestic machine. I will be posting close up pictures of quilting techniques over the next couple of days. 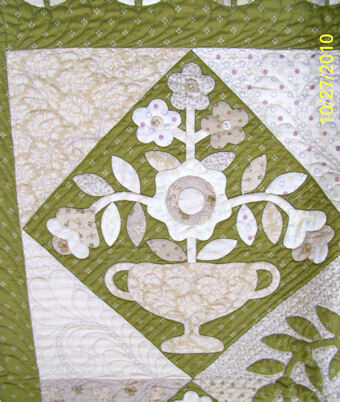 I am sorry but I did not take pictures of the Quilt Cards which gave details written by the quilter. My camera batteries are limited and had to be recharged frequently. 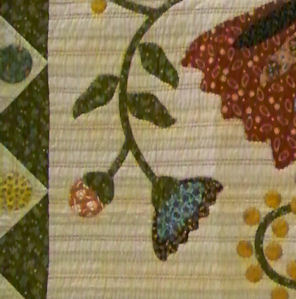 I opted to just take pictures of the quilts and the quilting details. 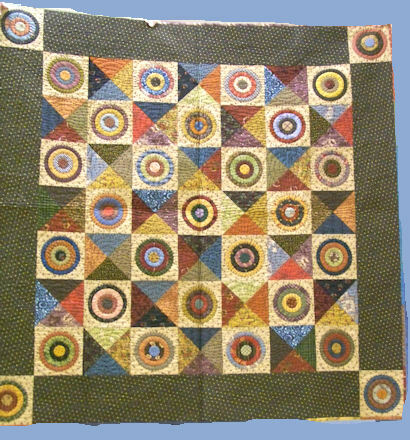 This is a collection of Antique Quilts from the 1850 to 1860. 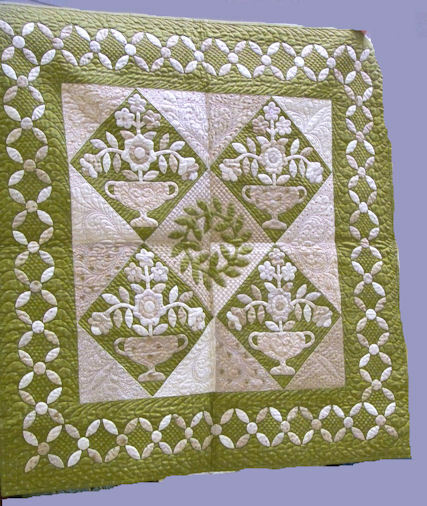 Most were hand appliqued and quilted. The red color is from SOLID TURKEY RED FABRIC. Some of these quilts have been handed down through the family, others were purchased while on vacation.